There are a few things I don’t have to think about in this life. By think I mean that razor faculty. That analysis. That untying of a concept or action, unpacking it in order to understand it. I don’t have to think about the words to the Jesus & Mary Chain’s April Skies; I don’t have to think about And the world comes tumbling down, hand in hand in a violent life, making love on the edge of a knife. I do, however, have to think to conduct a solid 90% of social interactions. I don’t have to think about my blind, mystic, quantum faith. I do have to think about time; it’s an amorphous blob to me naturally. I’m not made for space time and remarkably lousy at navigating it. I don’t have to think about who I care for. I know. I don’t have to think to draw my runes, to hear. I don’t have to think to sink deep into sleeping swan pose. I do have to think to say no. I live in a natural state of optimistic yes. I don’t have to think to be abstract; I’m forever spilling my metaphors all over people without ever bothering to explain they’re metaphors. To take me literally is to figure me insane. Or stupid. Not that those aren’t thoroughly fair assessments from time to time. I can be, it’s true, insanely stupid. I don’t have to think to work. It’s an instinct. Experiment, create, document. I don’t have to think to season food properly. I have to consider, but I don’t have to think. And I don’t have to think to make biscuits or scones, which is probably why this is the 3rd scone recipe to grace this site. I can have them in the oven in a few minutes flat. I don’t use a recipe, no. It’s a choreography I know well. I almost don’t have to use my scale. But I do. Hubris is probably no more delicious than it is becoming. But I can mumble my 80’s incantation; I can, bashful & alone, half sing under the April sun, under the April skies, sun grows cold, sky goes black with a smoky, quartz seer’s crystal burning a hole in my pocket, flour in my hair & the air smelling of white sage. I can weigh, pinch, stir, fold, fold, fold. And I can forget plenty of things that need forgetting. I especially like to bake when I’m sad or anxious or any of those states generally acknowledged to be both unpleasant & inevitable. I like it because when I’m successfully creative in baking, I feel good about myself. Not quite smug. But good. 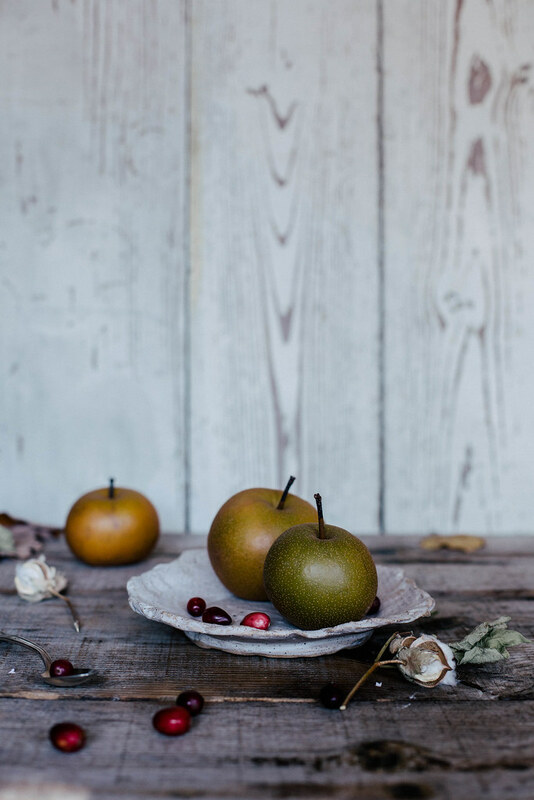 I love it when I can effortlessly incorporate seasonal finds—in this case golden Asian pears grown right here in Tennessee—when I can make do. Use what’s at hand. I had no eggs. Which is why you aren’t looking at a cake right now. Improvisation is liberating, and it appeals to my pathologically independent nature besides. These, these are my scones. They’re basically a riff on my buttermilk biscuits, and they’re chock full of the flavors of impending winter, of bitingly tart, fresh cranberries and bittersweet chocolate chunks (Chunks, not chips. Not messing around here. 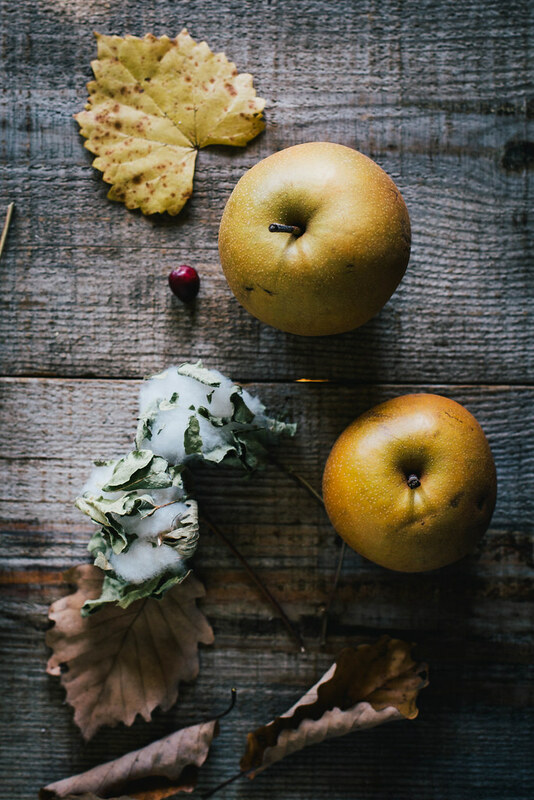 ), flecks of sweet cream butter, warm spices, and best of all, juicy bites of roasted pears. They’re big and crumbly, crisp on the outside and cakey on the inside. I like lots of crunchy sugar on top. You could make a glaze. I’d make a buttermilk glaze, whisking buttermilk into powdered sugar until I got my desired consistency. But I like them just so. Especially good news? 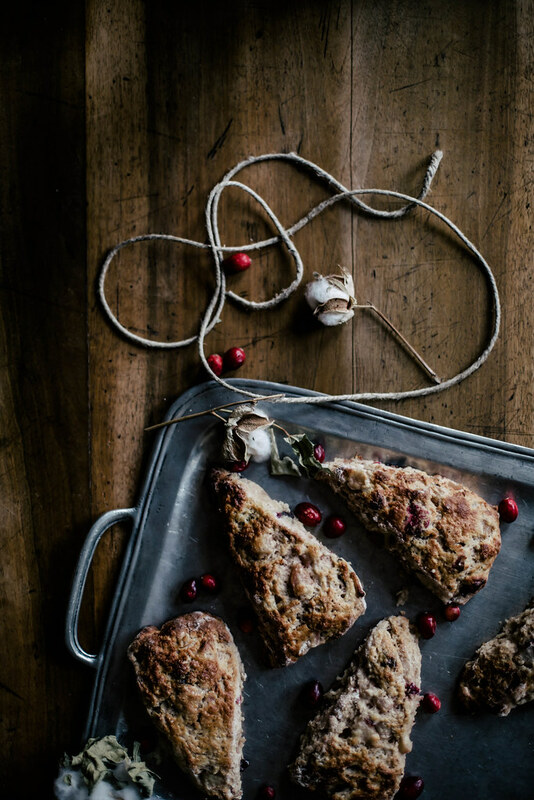 Freeze your unbaked scones on a baking sheet and store them in a ziplock bag once frozen. Bake straight out of the freezer, adding a few additional minutes to compensate for the whole them being frozen thing. 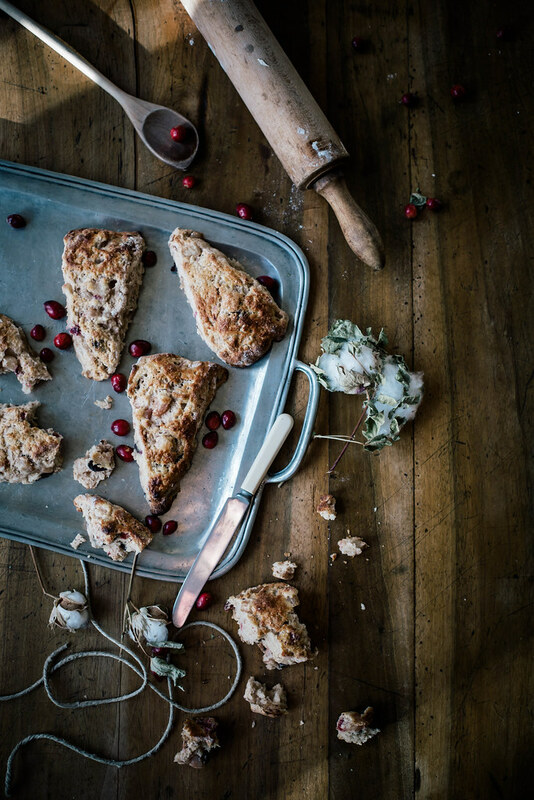 Enjoy fresh scones without thinking even if you have to think to make them; there you have it. Want to make your own version? Say to hell with my fillings? Simply substitute whatever sounds good to you in place of the fruit & chocolate. Add some crushed fennel seeds, bits of apple, and maple roasted pecans? Butternut squash, pine nuts, and sage? Black tea, lemon zest, and dried figs? It’s your life; they’re your scones. 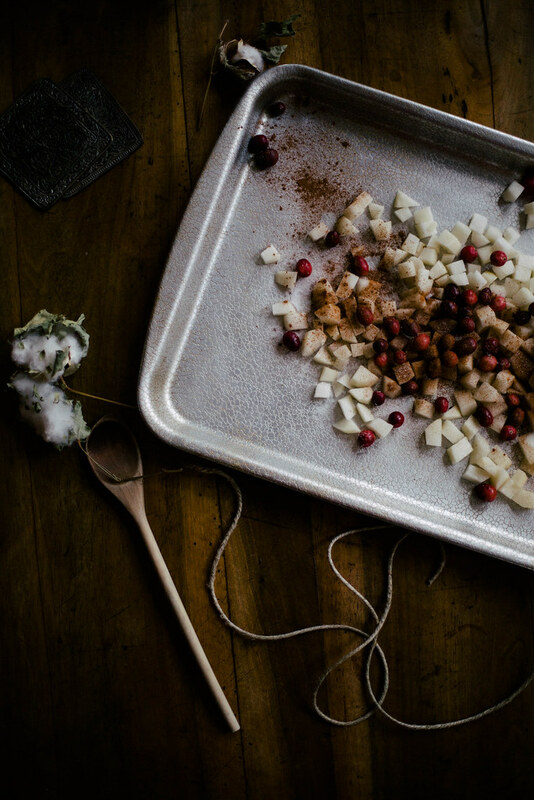 On a lightly oiled sheet pan toss pears, cranberries, 1/2 teaspoon of cinnamon, and 1 tablespoon of sugar. Roast for about 20 minutes, stirring them around half way through. Remove from oven and cool completely. You can stick them in the fridge to expedite this process. Increase oven heat to 425°F. Meanwhile, in a medium mixing bowl whisk together the flour, baking powder, 1/2 cup of sugar, 1/2 teaspoon of cinnamon, ginger, nutmeg, allspice, and salt. Using your fingers pinch the butter into the flour mixture until no pieces larger than a pea remain. You still want butter bits though, so stop as soon as no pieces larger than a pea remain. Stir in buttermilk until just combined, adding a splash more if it seems dry. Gently fold in roasted pears & cranberries and chocolate chunks. Turn dough out onto a well floured work surface (I use my counter) and sprinkle the dough lightly with flour. Using well floured hands pat the dough out into a long rectangle, the narrow end facing you. Think of it as the shape of a slightly long piece of notebook paper. Fold into thirds, like a business letter, towards you. Rotate the dough counter clockwise, again making sure your hands are well floured and that your dough isn't sticking to anything (flouring the surface as needed). Pat out and fold into thirds the same as before. Rotate counter clockwise once more. Pat this out into a long log that's about 1" thick and 4-5" wide and cut into triangles using a well floured knife or bench scraper, gently placing the triangles on the parchment lined baking sheet. Brush tops lightly with buttermilk and sprinkle with raw sugar. Bake approximately 20 minutes or until golden brown and cooked through. Depending on your oven you might need to rotate the pan halfway through cooking to ensure even browning; I do. 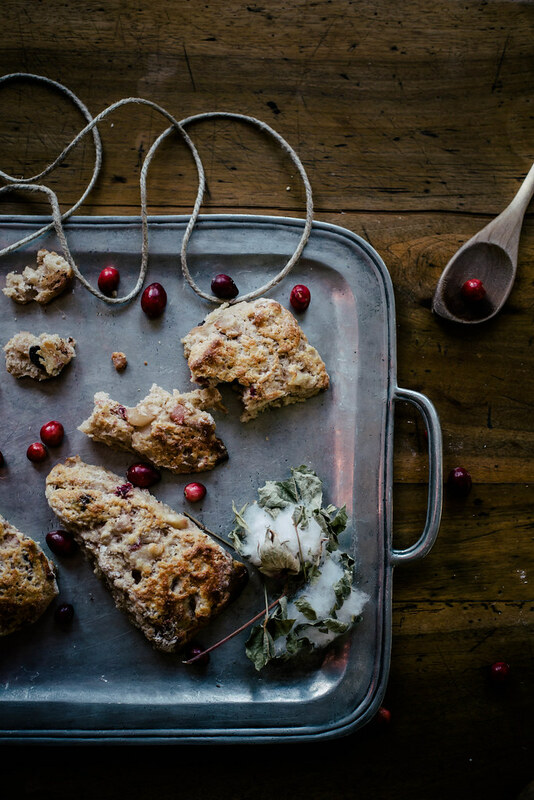 Remove scones from baking sheet to a rack to cool. Can be stored at room temperature in an airtight container or bag for a few days, but they're much better fresh. If you don't want a lot, I recommend freezing the ones you don't want to bake instead of storing already baked ones. 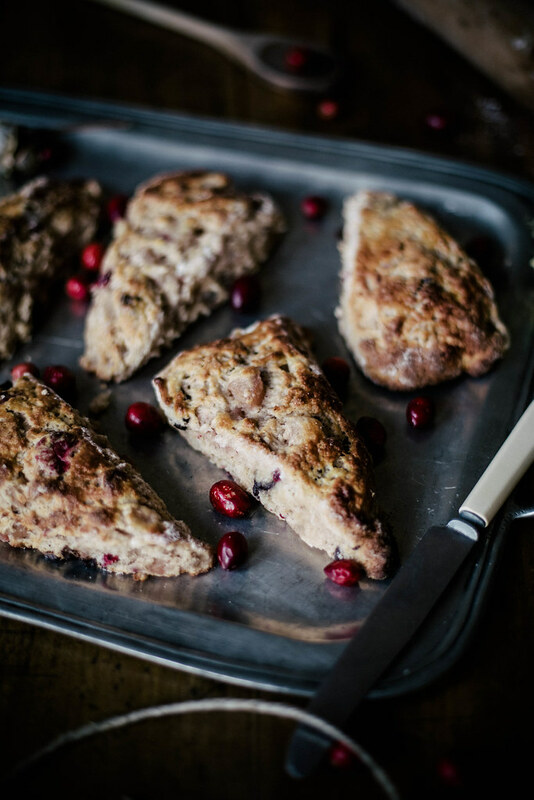 Bake frozen scones straight out of the freezer for about 25 minutes. Lovely! I simply love your pictures, the light, the composition…very inspiring! 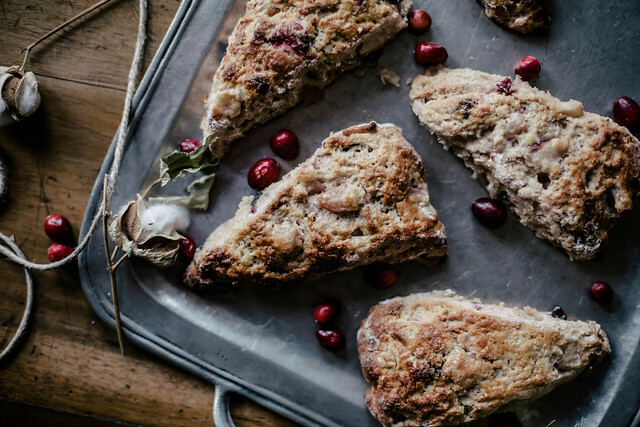 It’s always a pleasure reading your posts and these scones do look marvelous. I love adding tea to mine to kick up the taste buds a bit. I can’t even imagine not having to think to say “no” – it’s SO hard for me and I feel like I always get into situations that I’m not crazy about. Bleh! BUT! These scones are fabulous. Love the flavour and love the photos! Pear and cranberry, this sounds like an interesting combination. And it has chocolate! I think you got me 🙂 You pictures are beautiful, they make your food look even more special! Let me say, you speak my language and I love reading your words because, in my head, they don’t sound like words, just straight ideas; like an IV straight to my veins instead of having to go through extraneous channels. Does that make sense? Anyways, thank you and thank you for your scones. Can’t wait to try them! I made your honey pumpkin biscuits and they were insanely good! This recipe is definitely next on my list. I even have some pears languishing in the fridge, ready to go. I follow somewhere between 50 and a hundred blogs (with Bloglovin’), and I usually read them at work, at my desk, when I’m trying to keep sane amidst all the paperwork. But your blog I save for later. I save your blog posts to read at home when I can sit down and savor the words–really taste them. Sometimes I have to wait a few days. No other blog out there makes me do this. Not a-one. I came here for your pictures (pinned so frequently), and stayed for your words. 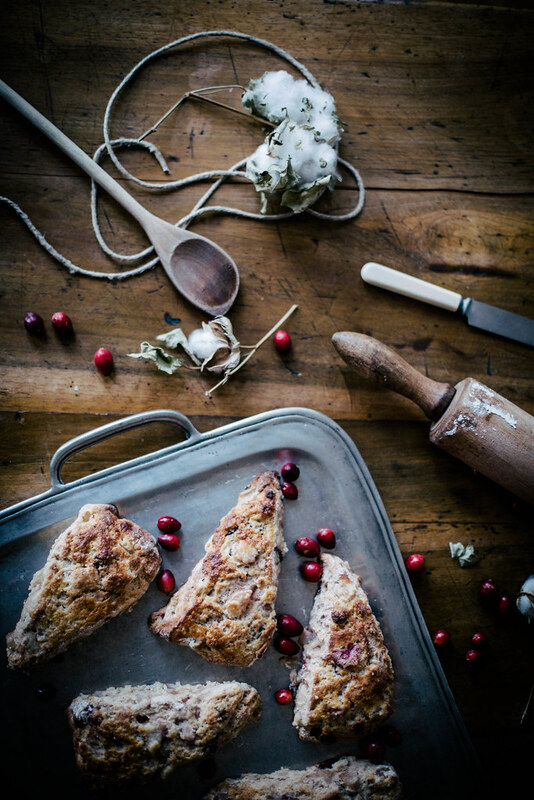 I dream of having the energy to make scones as beautiful as these when I get home, but it hasn’t happened yet. So for now, the words are nourishment enough. I have no doubt that people ask you to write a book frequently and eloquently, but let me add my voice to that clamor! thank u for the yummie recipe!! I enjoy reading your posts so much. I made your CRÈME FRAÎCHE, CORNMEAL, & PUMPKIN COFFEE CAKE + PEPITA STREUSEL and then I made it 3 more times within one week. Just do add, the coffee cake, in spite of a fancy name, was very easy to make! What a delicious and unexpected pairing! I recently discovered your blog, and I have fallen in love withe the beautiful photos, the authentic writing, and best of all, the amazing recipes. These scones in particular look delicious, but that may just be because I’m obsessed with all things cranberry related 🙂 You can be sure that I’ll be back here on a regular basis, though, even if it will typically end with me drooling all over my keyboard. quick question, or two: i can sub greek yogurt (or a mix of yogurt+milk) for buttermilk, yes? and if so, how would you incorporate black tea? can i just dump a bag in? First of all, what the name of the farm? I’d love to visit it if I had the chance one day. Secondly, yeah, a blend of milk & yogurt would work. I’d just watch for the right consistency of the dough as it might take a slightly different amount of that mixture. You want shaggy & wet but workable with a floured surface & hands. As to the tea, I’d either infuse the milk (get it hot & steep the tea in it—I’d make it strong) or I’d grind the black tea up into a powder using a mortar & pestle or a spice grinder and add it along with the dry ingredients. Up to you! thanks so much! i’ll do it. it’s called Green Door Gourmet. is on the west side of town. hope to see you out there! I like recipes where you have to get your hands in there and get dirty and get properly connected to your food. Scones are always so therapeutic because of that quality. Perfect flavours and, as ever, gorgeous photos. If I’m anxious, I like to oil paint. Cooking is fun but nothing brings me the comfort of oil paint and a great art panel. Hi Beth, It’s interesting – I’ve come to your blog via your beautiful images on Instagram and your great Pinterest feed & now I discover how strong your writing is. Did you know that the Australian version of scones are completely different to the American? I love cooking them for friends & use a Country Women’s Association recipe. This post made my morning. Thank you, thank you, thank you. What’s the yield for this recipe? Looks delicious, but I need to know how many it makes! 7-8 big guys depending on how you cut them. Cut the log in half and then cut small squares and your could get 14 smaller ones out. But cut the way I have, 7-8. Made these today for my mom’s 70th birthday breakfast. I used whole wheat pastry flour and forgot the chocolate, so put some in the oven at the end to melt it, then made a nice chocolate drizzle topping. Delicious. Could I used canned pears instead of fresh? I don’t see why not..just get rid of any excess liquid!